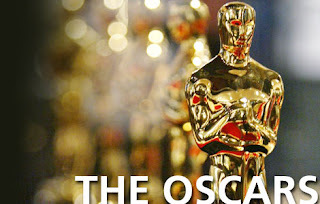 Oscars Noms 2012: My picks & predictions! Counting down to the Oscars but sadly, it'll be Monday morning in Singapore and I doubt my excuse of "I'm watching the Oscars, so I'll be in after lunch" is going to fly. But heck, it's once a year so here are My Picks: Films & talents that I think deserve to win and My Prediction: Films & talents that the old, white fogeys at the Academy will pick to take home the little, naked golden man. Disclaimer: I haven't seen the following movies that have Oscar nominations (for various reasons), so if you think my picks are way off because I haven't seen them, please holler! ACTRESS IN A LEADING ROLE - MERYL STREEP or GLENN CLOSE (Another tough one. Streep's good in almost everything she's in and I haven't seen Albert Nobbs, but from the trailer alone, Glenn Close is amazing in it. I love Michelle Williams' style -- helps that she was Heath's wife and mother of Matilda -- she's decent as an actress and it was a good effort playing Marilyn but I kept seeing Michelle rather than Marilyn. Rooney Mara gets props but honestly, it was more David Fincher than Mara at work. Anyone who knows me knows that politics is not my cup of tea (yes, this is on purpose). The only thing I probably know about David Cameron is that his wife had the audacity to not wear a hat to the royal wedding, and was totally under dressed. You're probably thinking, "oh, at least you knew that Cameron is UK's current Prime Minister" -- well, that's because Mrs Cameron committed an utter fashion faux pas. You get the idea. Reason for the rambling: Meryl Streep's The Iron Lady. Streep definitely does not dissapoint, then again, the only time she's teetered on disappointing is in Mamma Mia but I was probably just distracted by Pierce Brosnan's puppet-like acting. The movie cuts in and out between present day Margaret Thatcher, who seems to be grieving or with some form of dementia to Margaret Thatcher, the Prime Minister -- taking us through her decisions, her philosophies and her father's influence of the woman that she's become today. Interesting watch and Jim Broadbent is at his dependable best as Dennis Thatcher or DT. Love Broadbent. "Watch your thoughts for they become words. Watch your words for they become actions. Watch your actions for they become...habits. Watch your habits, for they become your character. And watch your character, for it becomes your destiny! What we think we become. My father always said that... and I think I am fine." On a somewhat related note, if you're planning to watch DiCaprio's J. Edgar -- don't go in expecting a biography. It's a love story between Hoover and Tolson, somewhat a quiet homage to complex relationships that may not always fall within the mainstream definition of love. DiCaprio overacts in parts of the movie -- for the record: I've been a fan of DiCaprio since his Gilbert Grape days -- which just shows how important it is for a good director in reeling in talent. I've seen Eastwood do much, much better with Gran Torino. Special effects makeup also needed some work. Snaps to Armie Hammer who was subtly good playing Edgar's quiet, loving and supportive Clyde Tolson and deserved more screen time. No clue why Ed Westwick was in the movie, basically played Chuck Bass. Bleurgh.